My guess is that this is a re-issue of an original 1969 recording, although the CD notes are not informative on this, being, I would again guess, a straight reprint of the original sleeve notes - which is a pity as I feel there is more that could be said here about the performers and the tunes. (I did try Claddagh Records’ web-site to see if I could find out more - but the URL printed on the back of the CD case didn’t work and an Internet search failed to find any other home page for them). The sub-title of this CD is ‘Fiddle music from Kerry played by Denis Murphy and Julia Clifford’, and that is precisely what we have here: tunes from Kerry played on fiddles by the brother and sister Denis Murphy and Julia Clifford - natives of the Sliabh Luachra region of Kerry, and well-known and influential proponents of the local style of playing. There is a good mix of tune types, with hornipes, jigs, slides, reels and airs all represented, along with the polkas for which Kerry is famous. The playing throughout is good, with lift and feeling, cleanly executed and played at a nice relaxed pace, not the fast speed one often finds with Irish playing these days, at least in sessions in England, and every track repays repeated listening. Most of the sets are played by the two fiddlers together, and very well matched they are, with their combined playing complementing and benefiting the tunes. The CD notes mention that the Sliabh Luachra region is also particularly renowned for slides as well as for polkas, and the recording includes two sets of slides. Of the latter, Dan O’Keeffe’s is interesting in that the second part is very similar to the second part of another excellent, four part, slide, Katherine Hehir’s Slide. As ever in these cases, one wonders which borrowed from which - but then this is a not un-common phenomenon. The polka sets will be familiar, although I wasn’t previously aware of the name Knockaboul Polkas for one of the sets. No such problem with the Balleydesmond Polkas - another well-known, popular set. As for the first set of polkas on the CD, personally I have never liked the polka version of Farewell to Whiskey which I don’t think transfers well to the polka rhythm, but perhaps I know the original slow air too well. There are four airs on the CD, two played by Julia Clifford and two by Denis Murphy. Again these are all well played and with feeling, with, for example, a particularly fine version of the ubiquitous Blackbird. Two of the airs, Caione Ui Dhonaill (The Lament of O’Donnell), played by Denis Murphy, and O’Rahilly’s, played by Julia Clifford, are, according to the sleeve notes, fine examples of the local tradition - and fine they are, too. Another track that stands out for me is their version of another very common tune, Fisherman’s Hornpipe. Again, it is refreshing to hear this tune played at a more gentle speed than has perhaps generally become the norm in sessions these days. In the dance tunes both players achieve a distinctive swing, often with stronger emphases on the off-beats assisting with this, and the overall feeling is of a relaxed style without any loss of the drive to the tunes. Masterful as the playing here is, and indeed it is, the fact that it is just one or two fiddles playing is perhaps my one minor problem with the album (apart from the sleeve notes), and I feel that it could have benefited from the addition of other instrumentation here and there. Even as a fiddle player myself I found the sound starting to tire partway through and I had to stop and come back to listen to more later, even with the good mix of tune types. 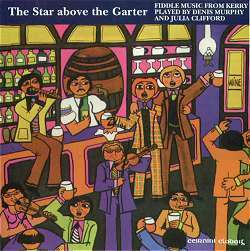 But maybe this weakness I felt is also a strength, in that the album is an excellent illustration of a particular style of Irish playing, that from Kerry, and without other instrumentation it is easier to hear and understand how the tunes are played. And perhaps that is as much the purpose of the album, as a record of a recognised style of playing by two acknowledged exponents. In summary, this is an album of well-played and well-chosen fiddle tunes, representative of a regional style of playing, and is a refreshing reminder of how Irish music can be, and can benefit from being, played at a less than hell-for-leather speed. It is well worth listening to, and its re-issue, (if re-issue it is), may help to make people aware of the origins of the tunes and styles and encourage them to re-discover these older styles. However, more informative sleeve notes would definitely have added to the enjoyment and value of the album for me and I feel more information could have been provided about the two musicians and their tunes.